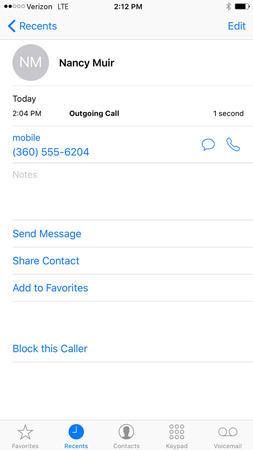 If you want to dial a number from a call you’ve recently made or received on your iPhone, you can use the Recents call list. You can also use the multitasking feature to make quick work of returning calls. Tap Phone in the Dock on any Home screen. Tap the Recents button at the bottom of the screen. A list of recent calls that you’ve both made and received appears. Missed calls appear in red. If you want to view only the calls you’ve missed, tap the Missed tab at the top of the screen. Tap the Info icon (a small i) to the right of any item to view information about calls to or from this person or establishment. The information displayed here might differ depending on the other phone and connection. 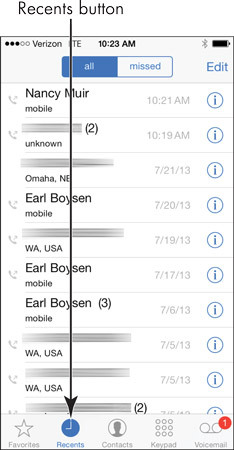 Tap the Back button to return to the Recents list, and then tap any call record to place a call to that number. Note that as of iOS 8, you can access folks you’ve recently contacted using the Multitasking feature. Double-tap your Home button and the Multitasking screen appears with a phone at the top of the screen indicating recent calls. Tap on one and you can then connect by tapping mobile, message, or FaceTime.